We wanted to create a dovetail jig that was easier to use and more ergonomic, with everything in a box. 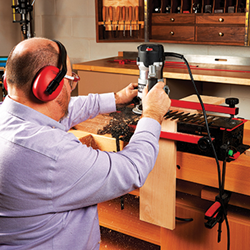 Woodworkers who prefer to make dovetail joints by machine have a new option – Woodcraft has added the WoodRiver Deluxe Dovetail Jig to its line of router accessories. The jig accommodates material up to 12-1/2" wide and 1/2" to 1" thick and comes with router bits and a half-blind dovetail template guide. A through dovetail template guide is available separately. Both templates are CNC machined aluminum. To learn more about Woodcraft, contact the store nearest you, visit http://www.woodcraft.com or call (800) 535-4482. To learn about Woodcraft franchise opportunities, visit http://www.woodcraftfranchise.com or email woodcraftfranchise@woodcraft.com.